By Jeanine Kitchel — Most people come to Mexico for sun and sand. But lately it seems there’s a fair share of both travelers and expats who are doing a whole lot more than soaking up the rays. Take Jill Allison from Seattle, for instance. She’d read Greg Mortenson’s Three Cups of Tea and wanted to give something back. So after landing in Merida in 2010 where she’d planned to spend extended vacation time, she happened onto edúcaTE. It’s a program that helps children in the Yucatan receive an education when their parents cannot afford to send them to school, and it was sorely in need of funding and on the verge of shutting down. It had 19 students under its wing. To save the program, she needed to find someone local to run it. That person was visual and ceramic artist Katrin Schikora. Schikora lives in Cholul, a pueblo near Merida, where edúcaTE is located. Then Schikora called on her friend Cheri Pittillo for help. The three formed a bond and decided they were good to go. Allison returned to the US and started registering the program as a charitable organization and non-profit. Schikora and Pittillo, local Yucatan residents, started tinkering with the charity to see how they could make it work. The simplicity of the program and what it accomplishes is probably what hooked Allison in the first place. 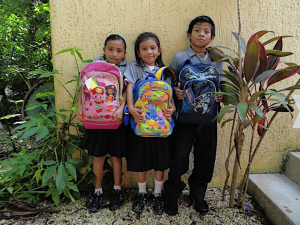 While the Mexican government provides children a free public education, it does not cover expenses of mandatory uniforms, specific footwear, and school supplies, thus children living in poverty often can’t attend school because of the additional expenses. EdúcaTE picks up these costs and now has 45 children in the program who couldn’t have gone to school before. Now registered as a non-profit both in Mexico and the US, the current focus of edúcaTE’s work is in Cholul. Katrin Schikora, executive director, explained how she was drawn into the budding organization. She wanted to do something for the disadvantaged population in Cholul, which she said was a small pueblo when she moved to Mexico 20 years ago. Of late, large houses are becoming more common, and in a town with many advantages, she knew there were also people who had nothing to eat. This program was a beginning, a way to help the local people. With a staff of eight volunteers Schikora set up headquarters in her ceramics studio. Schikora said the main emphasis of the program is to pay for children’s school costs, to give tutorials in math and physics for secondary students, and to give all types of tutorials for the primary grades. Many tutorials deal with learning English as a second language and one of her goals is to set up a more advanced language program that could be coordinated with volunteers. She feels this would also help kids improve their academic levels. She said often children will have little support from their parents as they want the children to go to work rather than school. So it’s a struggle for many in the program to even be there. Another part of edúcaTE’s emphasis it to give breakfasts to needy children in the group. The charity realizes that kids cannot learn if they are hungry. This part of the program is funded in part by the Merida Men’s Club, an informal group mostly comprised of expats that meets once a month. Donations are made for the program whenever the club meets, but oftentimes those donations do not cover all breakfast costs. EdúcaTE has 25 places for breakfasts and feeds kids in primary grades, four through six, as the government provides food for the lower grades. Schikora, who trained as an art therapist, said her goal is to be able to assimilate students into an integral development, and take them to exhibitions and on excursions. She has lots of plans. Presently the program is in need of new sponsors for next year and there is already a waiting list of 40 children. The selection process is done by word of mouth, and children are vetted through home visits to see if they qualify for the program. One of Schikora’s volunteers is her lifeline to the town, Doña Chula. She knows the entire village, said Schikora, and with a questionnaire, figures out a socio-economic study on the basis of the home visit, the child’s grades and the family’s need. More sponsors are needed to keep on track with what has already been accomplished. A rather unique way they’ve upped sponsorship was started by some older expats who travel back and forth to the Yucatan each year from the US. They’ve begun giving their grandchildren a sponsorship of a Cholul student as a gift rather than buying them presents for Christmas or birthdays. In this way the child plugs in early as to how to help others, and can see the progress made through edúcaTE’s website, or through notes written to them by the children in school. Check out the website at www.educateyucatan.org/ for info on how to sponsor children through the organization. A $140/US donation will sponsor one student in grades one through six for one year.